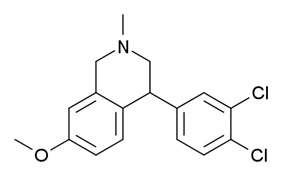 Diclofensine (Ro 8-4650) was developed by Hoffman-La Roche in the 1970s in the search for a new antidepressant. It was found that the (S) isomer was responsible for activity. Is a stimulant drug which acts as a triple monoamine reuptake inhibitor, primarily inhibiting the reuptake of dopamine and norepinephrine, with affinities (Ki) of 16.8nM, 15.7nM, and 51nM for DA, NE, and 5-HT transporters, respectively. It was found to be an effective antidepressant in human trials, with relatively few side effects, but was ultimately dropped from clinical development, possibly due to concerns about its abuse potential. Diclofensine is chemically a tetrahydroisoquinoline (THIQ) derivative, as is nomifensine.